Believing the right things is the key to a victorious life. 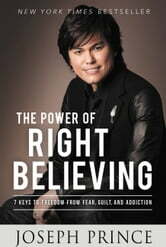 In THE POWER OF RIGHT BELIEVING, Joseph Prince, international bestselling author and a leading voice in proclaiming the gospel of grace, unveils seven practical and powerful keys to help you find freedom from every fear, guilt, and addiction. These keys come alive in the precious testimonies you'll read from people across America and around the world who have experienced breakthroughs and freedom from all kinds of bondages-from alcoholism to chronic depression-all through the power of right believing. God intends for you to live with joy overflowing, peace that surpasses understanding, and an unshakable confidence in what He has done for you. Get ready to be inspired and transformed and learn how to win the battle for your mind by developing habits for right believing. This is a phenomenal book. It changed my belief system completely inside out with the help of the Holy Spirit. Certainly it opened up eyes to see the strongholds in my life and allow the word of God (truth) to swipe across all the lie that I had believed over time. Praise be to God and many thanks to Pastor Joseph Prince for bringing out this anointed book for people like me. Fantastic book. Every time I read it, it is like my whole body is cleansed and a fresh feeling sets in. Renewing of the mind is repentance - changing of mind. Thank and praise Jesus for his hesed upon my family and my life. An eye opener and very freeing. It has made me open my bible and read with unblinded eyes. It is a very enlightening book and I want more.